The Monday morning of the week of Thanksgiving found me walking up the long sloping hill toward our nation’s Capitol building. There was a dampness in the air that spoke volumes about the change in weather since our arrival in Washington two days earlier and foretold of the rain that was coming soon. As I got to the edge of the Capitol property, I veered left and walked along the sidewalk that surrounded the periphery of the grounds, now heading away from the center of the free world and the building that housed all that power and history toward a much smaller but equally majestic structure. Suddenly, it loomed before me, tall and white, a steep set of steps leading up to an impressive set of marble columns crowned with Corinthian capitals. These supported a mammoth pediment from which figures I thought must represent the mythological gods of ancient Greece or Rome peered out over the grounds and down on the insignificant mortals who approached. Beneath them, four words were engraved into the center: “Equal Justice Under Law”. This must be the place, the great Temple of Justice, otherwise known as the United States Supreme Court and after spending much of my adult life keenly interested in it, I am finally going to enter it for the first time. 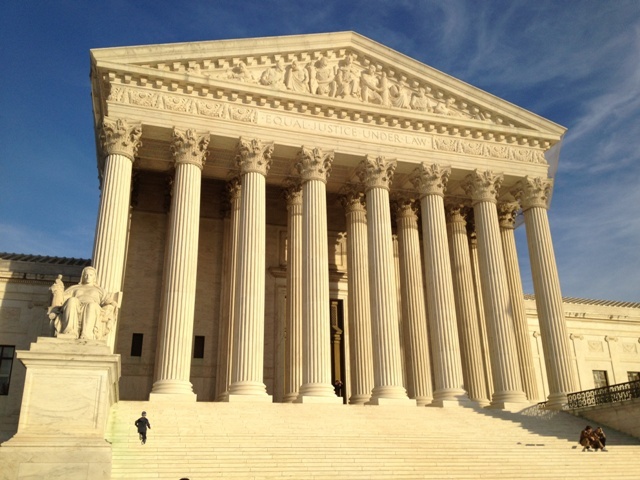 The beauty of the Supreme Court isn’t just the building that houses it but the fact that it isn’t one of the prime destinations of most of the tourists that come to Washington DC. To find them, one only had to look across the street at the Capitol building or further on down the National Mall to the Washington Monument and the Lincoln Memorial. Those wishing to get on a list and go through an extensive background check could also seek admittance into the White House, a mile or so beyond the Capitol. For those like me, interested in that other, equally powerful and unique branch of our Federal Government, the price of admission to the Court was a momentary inconvenience of a security checkpoint and a search of my person, after which I was left alone to explore the Court at my own pace. The Supreme Court is the least known and understood branch, certainly the most mysterious and the one most steeped in history so for many, a ride by the Court on a tour bus or trolley is usually enough. For me, however, it only scratched the surface. Exiting the security checkpoint, I entered a central hallway on the ground level that appeared to be at least 50 yards long. On either side were several displays, some freestanding, others built into the walls, each one calling for my attention. On the displays was information about the court and its history and inside the cases were artifacts that belonged to various Justices in the twentieth century. The top hat and leather carrying case of Chief Justice Earl Warren was in one while in another was the bust and photograph of President William Howard Taft, along with the House Resolution that called for the construction of the current home of the Court. For many, being President of the United States is the ultimate goal one could hope for in life but not so for Taft. He only reached his goal after having served first as President, when he was named as the tenth Chief Justice of the Supreme Court in 1921. 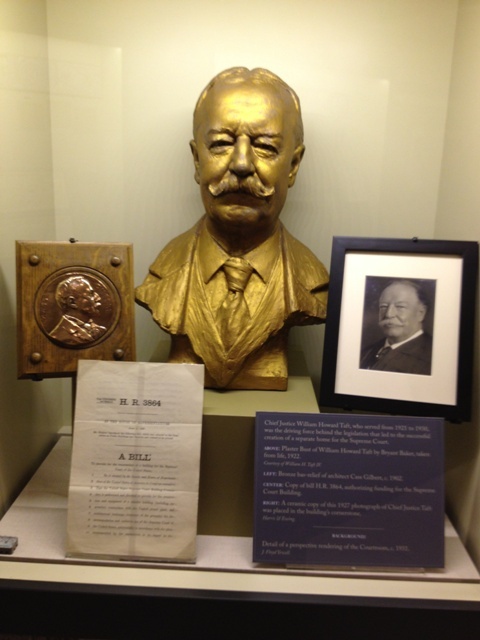 Taft served in this capacity until shortly before his death in 1930, earning the distinction of being the only former president to administer the oath of office to another President and the only Chief Justice to serve with associate justices whom he had appointed to the court. He was the driving force behind the current Supreme Court building, a project he never lived to see become a reality. Other exhibits told unique stories along the way about the history of the Court and its role as the ultimate court, unchallengeable and absolute. 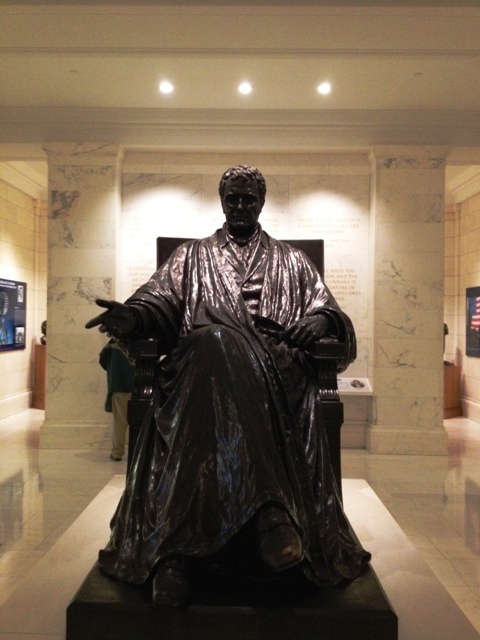 At the end of the corridor was a great statue of John Marshall, the fourth Chief Justice of the Court, seated in a chair and looking every bit the part of a judge. This statue once resided on the lawn of the Capitol but was moved to its current location at the intersection of the exhibit hall some years ago. Here the corridor turned in directions, left and right. My nose picked up the scent of coffee and since I had been told the cafeteria was open to the public, I decided to stop in for breakfast. Being the week of Thanksgiving, the cafeteria was fairly small and mostly deserted, with only a couple of security guards and a few maintenance workers having breakfast. I ordered and received a custom made omelet from the chef and then found my way to the coffee counter where several varieties of strong, aromatic coffee waited. A couple of young lawyers came in to get cups while I was fixing mine, looking every bit the role of a law clerk to one of the nine Justices, important looking and intense as they grabbed coffee and a muffin, then headed back out the door. I located a table and soon found out that the Court wasn’t the only thing “Supreme” in the building-they had Supreme Coffee as well! If the energy that fuels the minds that decide on the Constitutionality of our laws is derived from coffee, then I have no doubt that our Justices are intellectually superior on the basis of their coffee alone. Surprisingly, everyone there was friendly and spoke as if it were completely normal for some guy they had never seen to be enjoying an omelet and a cup of coffee in their dining room, from the security officers, cashier and maintenance people to the nice older man that came in through a side door to get something from the food counter, smiling and saying hello as he went by. I have to admit, the Court was not nearly as stuffy as I imagined it would be. After breakfast, I went back out to explore the rear hallway that ran the entire width of the building and which intersected at the John Marshall statue. A nice theater was available I went in to watch the 25 minute long movie that was just about to start, feeling something like a dignitary at having this entire theater to myself. The movie chronicled the history of the Court, including the construction of the current building in 1935 and interviews with the various justices currently serving the Court about the role of the Judiciary. I learned that the figures carved into the pediment outside weren’t actually mythological at all; in fact, each one of them was someone that had something to do with the construction of the Court building, including Taft as a young lawyer studying his books. Of course, I nearly choked when one of the interviewees appeared and I realized that the older man I had seen in the cafeteria, completely devoid of any identification at all was none other than Stephen Breyer and I had been eating an omelet in the presence of a Supreme Court Justice! Such is the anonymity that most of them enjoy, each one a shaper of our law, yet still probably able to walk down the street without anyone knowing who they are. Upon leaving the the theater, I walked the hall slowly, stopping to look at the enormous oil paintings that hung along the walls, all of them familiar names to me even if I could not place all the faces. 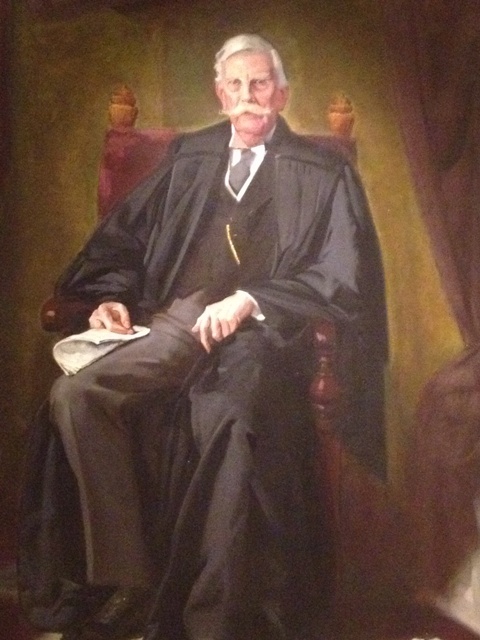 One I knew real well, his identity given away by the long face and curved mustache that he was known for, Justice Oliver Wendell Holmes, one of the greatest of all the Justices in the history of the Court. Others, such as Hugo Black, Felix Frankfurter, Thurgood Marshall and Sandra Day O’Conner gazed out in black-robed silence, looking every inch judicial and wise. Looking at my watch, I realized I only had an hour left so I found one of the long marble staircases and ascended to the main floor of the Court. At the top of the stairs, I turned and walked slowly into what can only be described as a temple; a great hall that soared at least thirty or forty feet high that ran from the front of the building to the rear wall, its roof held high on massive columns of the purest marble and lit by lamps that hung from long chains. 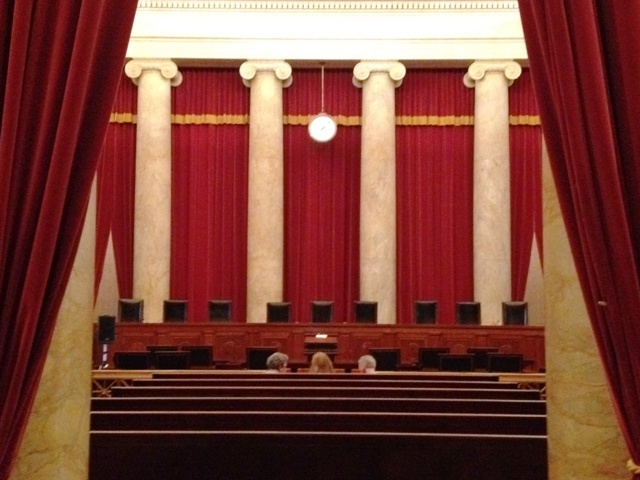 In each space between the columns, which formed an alcove, a bust of each one of the past Chief Justices of American history stood on a plinth, gazing out across the hall at each other and anyone else who happened by. 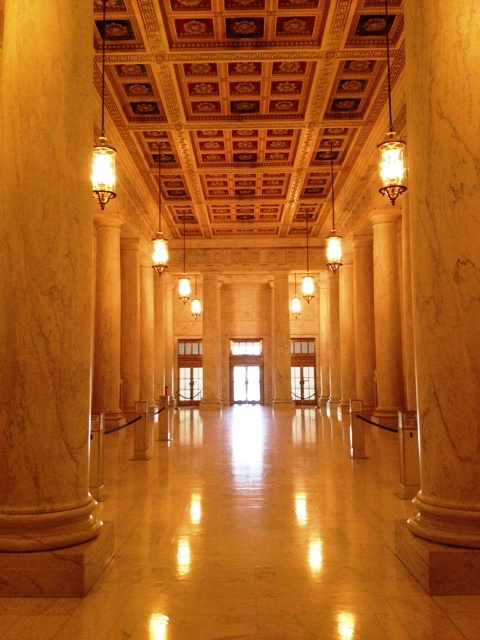 This entire room was completely absent of any displays, save for the columns and the Chief Justices reflected in the gleaming marble floor; in fact, it was almost colorless until you looked up at the ornamental ceiling which was made of up in sections of alternating red and blue and decorated in gold. I could only imagine the effect this magnificent chamber would have on a lawyer making his or her way down it to face the Justices in the courtroom ahead. Court was not in session that day but the doors were open and I was able to go in a few feet and see the splendor of the room where the very nucleus of the law, our Constitution, is used as the final measure of whether a law is just, whether a person has been afforded every opportunity under it and whether an entire nation may have to rethink how a particular law is applied. 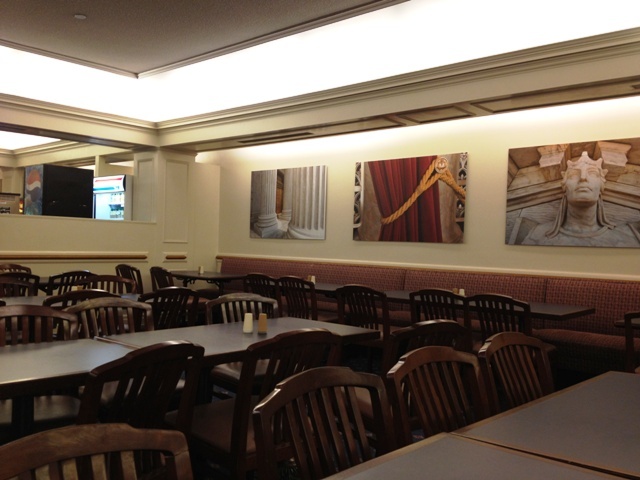 Nine empty chairs sat behind a long bench that curves out at its ends, chairs for the six men and three women that now make up our Supreme Court. For any lawyer, it is the highest honor and privilege just to be able to stand before that body and make an argument, even in the short amount of time that is allotted for them to present it. For those that sit behind that bench, they are a part of a history that goes back to the beginnings of our nation, a select group of learned individuals that have been given the job for as long as they wish to hold it and who hold something in their hands that is felt but never seen…..the consent of the governed to be ruled by law. It is an enormous responsibility that they carry and seeing the chamber from which they discharge their responsibilities only underscored the importance of what they do. For some, they are the last hope; for others, they are the effectors of change that will hopefully make our nation and our society more just. To put into words how I felt to be standing in this great place is a difficult task and many have come before me and said much of what I have said and experienced here. Still, each experience is unique and so mine will be as well. You can read about something, study it, learn about it and think you know about it but some things just have to be experienced to be properly understood. It isn’t the building, though it is grand by all measures and it isn’t just the history, which runs deep and which has shaped and carved our laws into what they are today. Here, you can feel the power of the law and be unashamedly awed by it, while at the same time, being appreciative that you are a collective part of what enables it by your own consent to be governed by it. I would experience other such feelings while I visited the various sites of Washington but for me, if this was all I had gotten to experience while I was here, I would have felt a very privileged person. It was appropriate that I saw it the week of Thanksgiving too because it reminded me that I am thankful to live in a society that strives to be a just and humane one, where individual rights are protected and preserved and where freedoms are the norm and not the exception. I am also grateful that we have nine guardians who have dedicated their lives towards perpetuating that society and I will not likely ever forget my visit to this special place.